It was a joyous scene at the K.C. Irving Regional Centre on May 13 when the Acadie-Bathurst Titan locked down a 2-1 victory over the number-one seeded Blainville-Boisbriand Armada in front of a sellout crowd on home ice. The Game 6 triumph not only secured the first President Cup title for the Titan in 19 years but also served as the team’s ticket to Regina with the opportunity to compete in the 100th Memorial Cup tournament. It was an even greater scene at the viewing party hosted at Promenade Waterfront Park in Bathurst on May 27, as the Titan captured the organization’s first-ever Memorial Cup championship thousands of miles away. 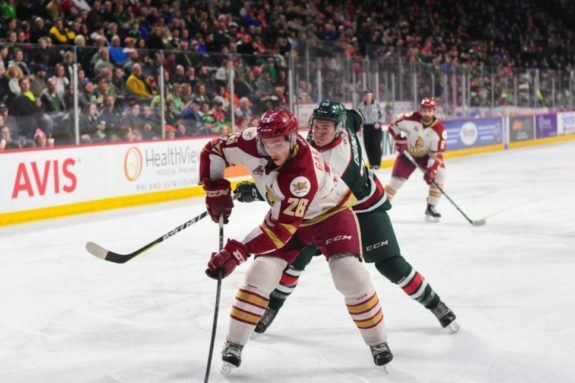 The Titan, widely considered an underdog heading into the tournament, not only kept up with the tough competition in Regina but won their way directly to the Memorial Cup via a 3-0 victory. Bathurst, without any true superstars on its roster, locked horns with the host Regina Pats in a winner-take-all game that did not disappoint. Under the tutelage of fourth-year head coach Mario Pouliot, the Titan players collectively bought into a common game plan and didn’t let up until the final whistle. In doing so, the team initially viewed as the underdog quickly transformed into a tournament favorite and was eventually crowned champions. Bathurst is a small town in northern New Brunswick and represents the smallest market in the entire Canadian Hockey League. The organization relocated from Laval, QC in 1998 and went on to win the QMJHL championship during its first season in New Brunswick with a team that featured Roberto Luongo and Francois Beauchemin. This season’s championship team featured a potential future NHL star in defenseman Noah Dobson and represents the organization’s first title win since its inaugural season in Bathurst and its first appearance in the final since 2002. Prior to this season, the Titan had long struggled to put a winner on the ice and faced an uncertain future on more than one occasion. Located in such a small market, Bathurst had regularly suffered from poor attendance numbers until this season. Longtime owner Léo-Guy Morrissette ended up selling the team in 2013 to a large group of investors, which includes Philadelphia Flyers forward Sean Couturier, in order to keep the team in Bathurst. Attendance figures soared this season, offering further proof that icing a winning team makes a world of difference. The team enjoyed several sellouts during the year and rewarded its fans with the most successful campaign in the organization’s history. Titan general manager Sylvain Couturier, who is the father of the Flyers’ star, saw a window of opportunity for his squad and loaded up during the QMJHL’s winter trade period. The GM made several big deals during the months of December and January to bring in key pieces Olivier Galipeau, Samuel Asselin, Mitchell Balmas and Evan Fitzpatrick. He also acquired Flyers first-round draft pick German Rubtsov in a November trade with the Chicoutimi Sagueneens. The moves cost the Titan several picks and future assets, but the end result made the gamble worthwhile. Galipeau, an undrafted over-age defenseman, led all QMJHL rearguards with 25 goals and 74 points en route to being named the 2018 QMJHL defenseman of the year. 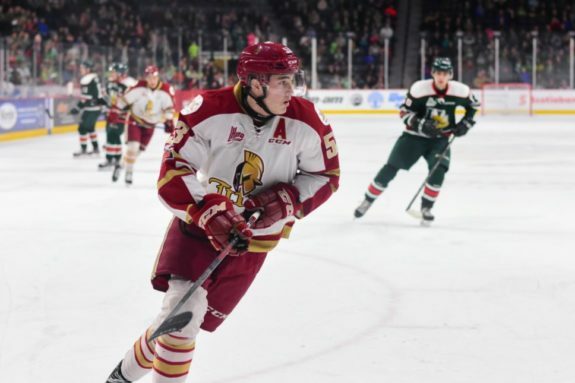 The former captain of the Val-d’Or Foreurs helped solidify an already impressive Titan defense corps and formed a fantastic pairing with projected 2018 first round NHL pick Dobson. Asselin is a 19-year-old heart-and-soul type player who was captain of the Shawinigan Cataractes. The 5-foot-9 winger plays an agitating game despite his stature and scored a goal in all four Bathurst games during the Memorial Cup tournament. Balmas was another key 19-year-old forward, who scored 42 goals during the regular season before adding five more during the playoffs. Fitzpatrick, a St. Louis Blues draft choice, was rock-solid in net since his arrival in Bathurst and held the fort in the Memorial Cup championship game by shutting out the Pats. Rubtsov, meanwhile, served as an excellent defensive forward for the Titan while also chipping in on the offensive side of the puck. Each one of Couturier’s in-season acquisitions came as advertised for the Titan. They blended right in with the existing team and played vital roles in clinching the ultimate prize in Canadian junior hockey for Bathurst. Entering the 2017-18 season, the Titan had a pillar both up front and on the blue line in the form of Antoine Morand and Dobson — both of whom served as part of the Titan’s leadership group. Morand, a second-round pick of the Anaheim Ducks, led the team with a career-high 76 points during the regular season while Dobson broke out for 69 points in his sophomore campaign. There may not have been a lot of well-known names on the Bathurst roster, but there definitely wasn’t a shortage of unsung heroes on the team. Captain Jeffrey Truchon-Viel was a key cog all season long. He finished his final junior season with 39 goals in the regular season, another 14 in the playoffs and scored 10 points in four Memorial Cup tournament games. To say that Truchon-Viel was an important piece to this Titan squad would be a huge understatement. Other unsung heroes include overage defenseman Adam Holwell, who should get some pro offers for next season, as well as longtime Titan forwards Jordan Maher and Samuel L’Italien, who scored the President Cup-clinching goal. American forward Liam Murphy and the ever-improving NHL draft eligible Ethan Crossman were also impressive during the run to the top. 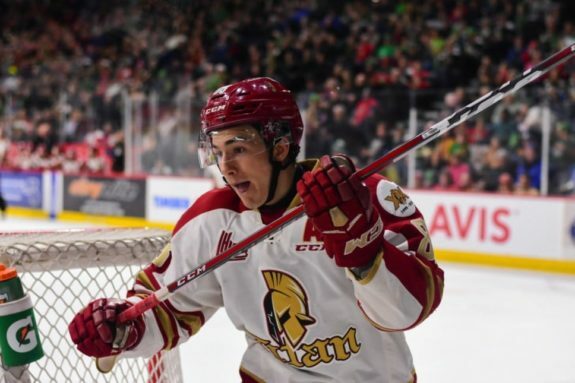 The Titan, a strong team from top to bottom, needed only 20 games to become QMJHL champions and are now, for the first time in franchise history, Memorial Cup champions as well.